Guests staying at Cedar Point Resort hotels are entitled to enter the park one hour prior to the posted admission time. The most convenient choice is Hotel Breakers, located directly beside the back entrance of the park, but the room prices reflect its location, coming in at roughly double that of any of the other options. Instead, we chose to stay at Breakers Express, which was clean, comfortable, and (relatively) cheap. Enthusiasts should be aware, however, that this hotel does not have on-site breakfast, so plan accordingly. Only a small number of rides operate during the early entry hour. We started our day with three laps on Gatekeeper, figuring that it would be the only time we'd be able to get on it without a lengthy wait. We followed that up with two rides on Millennium Force, one in the back, and one in the front. There are few better ways to wake up than a front seat on a major roller coaster. When the rest of the park began to open, we made our way towards the Cedar Creek Mine Ride. We were actually in the train when the operator asked us to move back to the platform while he investigated something in car three. Moments later, he had the entire lap bar assembly in his hand, remarking in a calm voice that "we obviously have a mechanical problem". Rather than wait for engineering to arrive, we decided to leave the queue and return later in the day, figuring that a full safety check would take a while. Instead, we went over to Woodstock Express. A young child joined the queue shortly after we did, and given the nature of the ride, we let him have first choice of seat. He took the front, so we took the back. It was interesting to see the posted limit of 330 lbs per car, which we were well below; I couldn't help but remember the signs on the Swan Boats at Michigan's Adventure talking about a strictly enforced weight limit of 300 lbs per guest! Gemini was only operating the red track today, and this immediately triggered a discussion about whether the coaster counted as one or two credits. 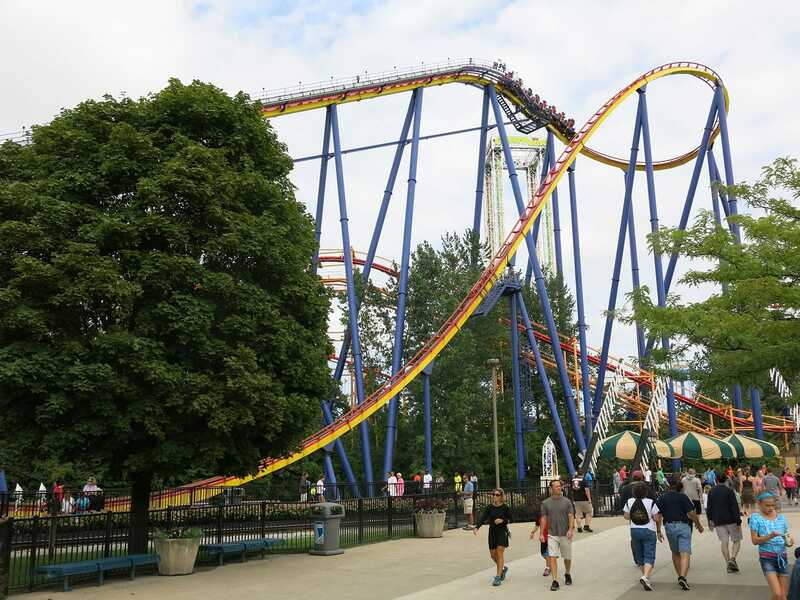 My rule on this has always been firm; if the park considers a set of coasters to be one attraction, then so do I, though there have been some potential ambiguities along the way. Megan takes the opposite perspective, in that every complete circuit track is a credit of its own. Fortunately, we both agree on the most disputed topic among coaster counters; powered rides do not count. If either of us ever own a park, we'll be sure to install a Zamperla Dragon named Definitely Not A Credit. You read it here first, folks. Magnum XL-200 was a walk-on, and two cars were roped off presumably to aid loading speed. It'd be great to see this ride refitted with somewhat more forgiving lap bars, especially for the second half of the course, but notwithstanding the bruises the ride was still a lot of fun. Cedar Creek Mine Ride had reopened at this point, albeit without the damaged train. As I write this now, a few weeks later, it's impossible for me to think of anything interesting to say about what was a thoroughly unmemorable ride. On the other hand, there are a lot of things I can say about Mantis, but very few of them are printable. On the positive side, the ride was wearing a new coat of paint and gleamed in the mid afternoon sun. Equally positive is the fact that one of the three trains has become a parts donor to the other two, meaning that at some point the supply of spares should run dry. That day cannot come soon enough; though a B&M ride, Mantis was rougher than a twenty year old Pinfari with OTSRs on a bad day. It was brutal, horrible, poor, lousy, dreadful, awful, unpleasant, and, in conclusion, generally not good. We did a lap of the park with our cameras in order to recover, finishing up at Top Thrill Dragster. It was more than a little irritating to see every third train pull up to the loading platform with passengers already in the front seats, presumably from paying Plinko. 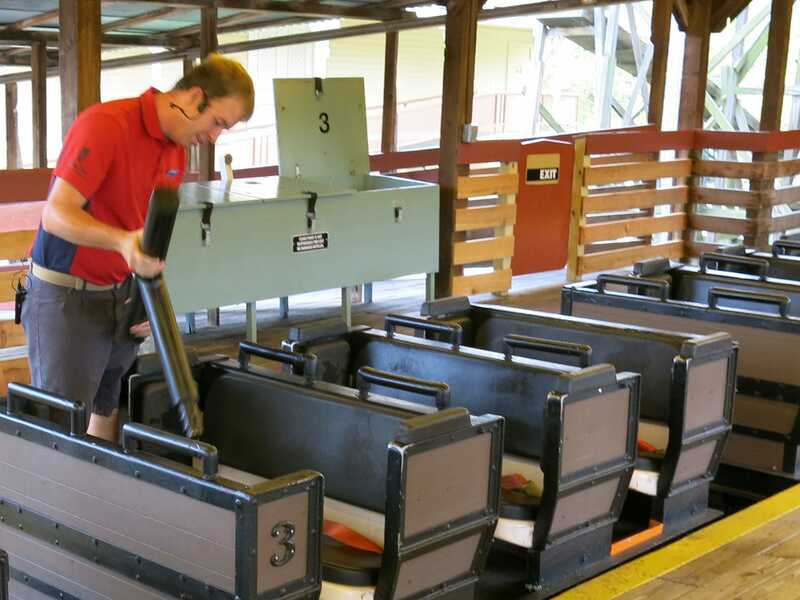 As I noted yesterday, I'm not at all sure whether I approve of this in general, but I definitely do not approve of large quantities of front seats being taken by this method; winners of this game should be allowed to join the ride queue in the station area in the same manner as those using the Fast Lane passes. As luck would have it, we managed to get the last front seat ride before a lengthy breakdown that lasted more than an hour. As the train began to accelerate, the ride made a spirited attempt to remove my strapped glasses, which has never happened to me before on any ride (including this one). I came to the conclusion that the angle of the wind against the lenses produced lift in the same fashion as an aircraft wing, and it was only my presence of mind that prevented their loss. We finished our day with a quick run through the coasters at the front of the park, taking in a front seat on Iron Dragon, Wicked Twister, a back seat on Raptor, and finally a front row on Blue Streak. The latter was much more enjoyable towards the front of the train than the back yesterday; we'd have repeated it, but decided against it given the long drive ahead.